Check out these little beauties. Fresh off the production line. Each medal is 3mm thick and 70mm wide, attached to a white ribbon with printed logo. Every finisher gets their mitts on a medal for their chosen challenge. 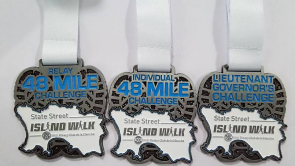 What better incentive do you need to keep your feet moving than the knowledge of being presented with a specially designed medal at the finish.